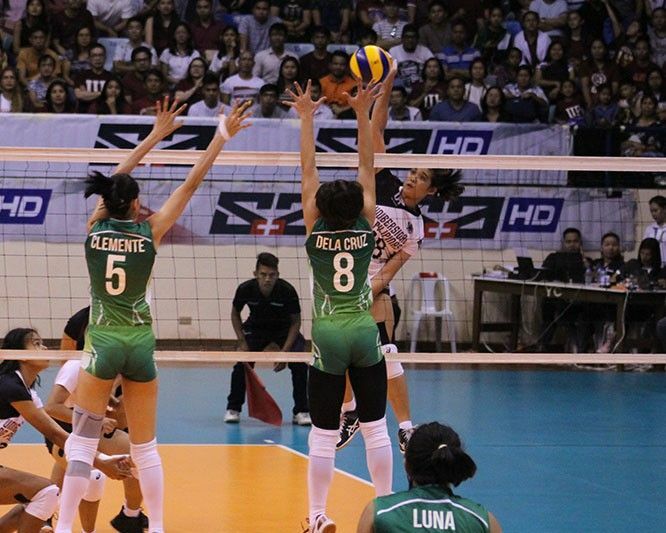 MANILA, Philippines – It was a very eventful UAAP women’s volleyball Sunday at the Ynares Center in Antipolo City. I am not surprised that FEU bested Adamson in a closely fought five-set thriller (30-32,25-20, 23-25, 25-20, 15-13), but am really surprised that the De La Salle Lady Spikers went down in three straight sets to resurgent UP (25-16, 26-24, 25-19). FEU is currently on the outside looking in the Final Four with a 5-3 record although tied with UST and UP. They have won two five-setters over Adamson and are 2-1 in five-set matches (the only loss to Ateneo). This is a team on the verge of putting it together. If they do, they will zoom up the standings. But they have yet to display that against the upper echelon of squads, namely, Ateneo, La Salle, and UP. In the 32 full sets (not counting fifth sets), they have scored under 20 points only six times. That is as many as Ateneo has. La Salle has four sets where they score 20 or below. UP has four. UST has the fewest with three making them in my opinion, the hardest to beat, sans their win-loss record. Nevertheless, that means in almost every set, the Lady Tamaraws hang tough. In my opinion, the toughest player FEU has is rookie Lycha Ebon and she’s out with a knee injury (for not too long I am told). But it couldn’t have come at a crucial period. And when it comes to the knee, you don’t want to take chances. Lady Tamaraws head coach George Pascua has tapped Ivana Agudo to step up in Ebon’s place pending tests and rehabbing. How that works out is anyone’s guess, but if Feu wants to return to the Final Four they have to pick up their game. In volleyball, just as any sport, there is this flow and ebb. We’re also looking for that game where FEU turns on the jets. This is how they have gone so far — win, loss, loss, win, win, win, win, loss and win. That first round win a fluke? Until someone proves otherwise, the Lady Maroons are the only team to have La Salle’s number this season. And what a win — in three sets (even if it wasn’t the prettiest game to watch). Granted that La Salle’s errors really hurt them, but that is part of the game. It was a grind-it-out win that UP surely needed. When was the last time we saw La Salle this shaky? That was the last time Ateneo was the champion — four years ago. Granted three losses does not a season make; the spotty play has been there — against NU (despite a win) and the consecutive losses that followed (against UP and UST). The errors they committed were shocking. So, you know that isn’t the norm for them. The spotty play though has often happened. And it isn’t exactly a young team they are parading. But until they are dethroned, they are still favorites to put it all together and win.